FILE - Afghan National Army troops prepare for an operation against insurgents in Khogyani district of Nangarhar province, Afghanistan, Nov. 28, 2017. 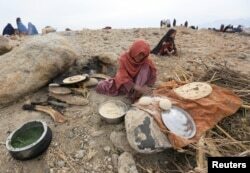 An internally displaced Afghan woman who fled from recent conflict cooks bread outside a shelter in Khogyani district of Nangarhar province, Afghanistan, Nov. 28, 2017. Afghan joint forces drove IS extremists out of the Pachir Wa Agam district in Nangarhar last December, and then hundreds of local men joined the central government's security forces to help ensure that IS radicals cannot return to the area. The Afghan Defense Ministry talked down any “serious” IS threat in the area, asserting that militants are trying to terrify unarmed locals at the behest of regional intelligence agencies. General Mohammad Radmanish told VOA that multiple military operations are underway in eastern Nangarhar province to remove remaining IS fighters. Joint U.S. and Afghan forces’ air and land operations killed at least 100 IS militants in the province in the past two weeks, Hayatullah Hayat, Nangarhar’s newly appointed governor said last Tuesday.